LightRail 5.0 is unique because of the LightRail 5.0 crossbar configuration. That crossbar allows for two medium grow lights or two large grow lights per crossbar. Or, the LightRail 5.0 crossbar configuration can handle three smaller indoor grow lights per crossbar. And, as we look at the photo, we can see the crossbar can be lower near the Motor and then angled up for the grow light ends. 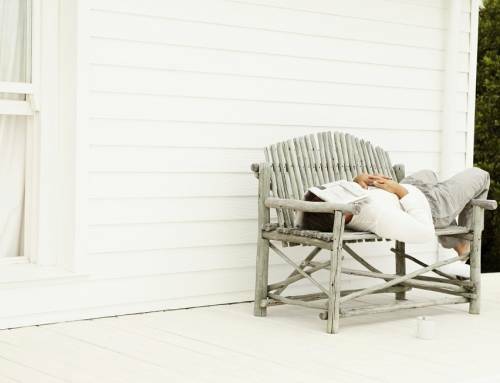 Or, that indoor grow system detail can be reversed. In that instance, the crossbar can be turned so that the grow light ends are lower than the section under the grow light mover Motor. This LightRail 5.0 crossbar configuration adaptability gives us important options for our grow light systems. LightRail 5.0 crossbar configuration allows for two larger indoor plant lights per crossbar. 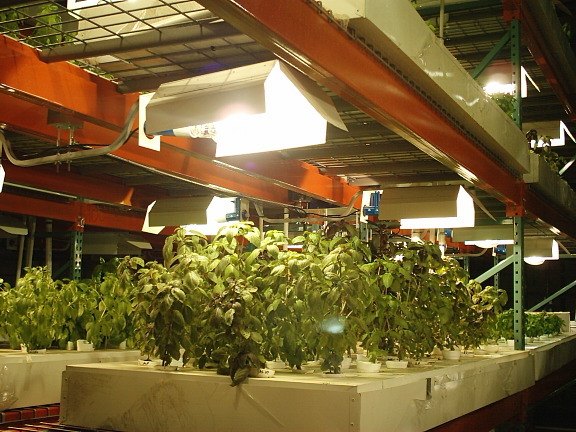 Or, this grow equipment part allows for three smaller indoor plant lights along the span. 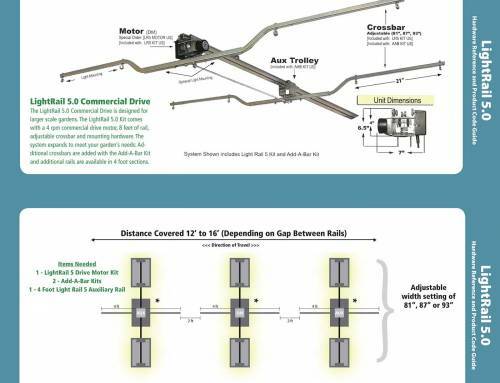 For the adjustable crossbars of the LightRail 5.0 Kit, those are at about 81”, 87” and 93” for the span. At 81”, the closest grow light system mounting holes for the grow lights are 37” apart. For 87”, the closest grow light system mounting holes for the grow lights are 43” apart. For 93”, the closest grow light system mounting holes for the grow lights are 49” apart. All of those are looking at the inner end of the grow light to the inner end of the other grow light on the same crossbar. Also, the mounting holes on each crossbar give us four variations as we hang our grow lights. So, we can finesse this indoor grow system a bit overall. 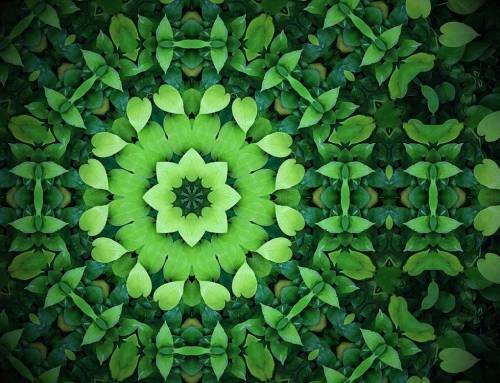 Perfect balance is key, however, so we want to mirror any grow light hanging exactly. If there are vented grow lights in play, in other words, any grow equipment ductwork, LightRail 5.0 is not recommended. Again, perfect balance is key and ductwork tugs unevenly causing issues. In that instance, we would want to simply use parallel rows of LightRail 3.5 Kits with Add A Lamp Kits. And, we’d want to use Extreme Duty Trolley Wheels for both the motor and the auxiliary trolley of the Add A Lamp Kit. This combination would make for a serious commercial, workhorse kind of setup. In other words, that grow room design using LightRail 3.5 is very capable. Can the LightRail 5.0 function without the wide pattern of the crossbar? Yes, and there are two ways that can work. We can turn our crossbar 90 degrees so that it runs in-line with the Rail. That allows our two indoor grow lights to now move in-line with each other. Or, we can simply move one heavier grow light or camera equipment or anything we might come up with just under the Motor. We can also use it this way for double banks of grow lights running down the aisle way of vertical growing systems. There is another instance when LightRail 5.0 might not work as well. And, that’s just with looking at that unique LightRail 5.0 crossbar configuration. Sometimes the crossbar span simply does not work for our grow room setup and with our grow room design dimensions. In those instances, we have more grow equipment design control by using LightRail 3.5 Kits with Add A Lamp Kits. And, we would then have the grow room design space flexibility of positioning our parallel rows of LightRail 3.5 as far apart as makes sense. So, each indoor grow room setup is unique for space. And, the LightRail 5.0 crossbar configuration might not be just right for a specific grow room design. 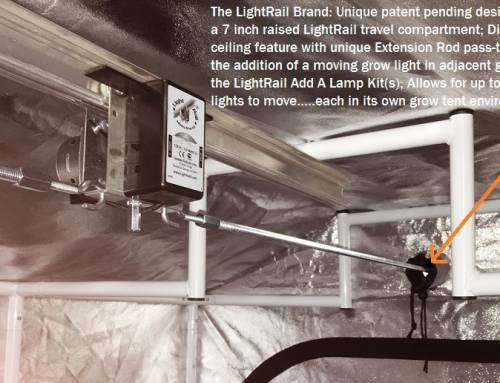 LightRail 5.0 is a different style of grow light mover. And, that is primarily because of the LightRail 5.0 crossbar configuration. It used to be thought that only LightRail 5.0 could handle the heaviest grow light weights. But, that thinking has changed, at least with LightRail light movers and their very capable Motors and wheel options. Still, LightRail 5.0 is seriously capable at 100 lbs per Rail. And, the Motor and Rail are larger and wider, and it’s not even interchangeable with the other LightRail series. So, the LightRail 5.0 is another unique LightRail light mover option. And, even though it is a fairly specific option, it gives us many sub-options for grow equipment usefulness.